Of course the name grapelade for grape jelly is a bit odd and I knew this ad was from the early 1900's so of course it sparked the research side of me into high gear. I soon came upon a most boring document about the history of jam and jelly but locked inside it's soporific tomes was the information I was looking for. Apparently in 1917 Paul Welch secured a patent for the process of pureeing grapes and turning them into jelly. This product was called grapelade and the US Army bought the entire production and sent it over to the doughboys fighting against the Germans in Europe. When soldiers came back home they demanded this grapelade and Welch was only too happy to oblige. This ad would have been from late 1918 when grapelade was first introduced to the market. Before this time store bought jams and jellies were nonexistant and usually small batch affairs made by farms and sold locally. 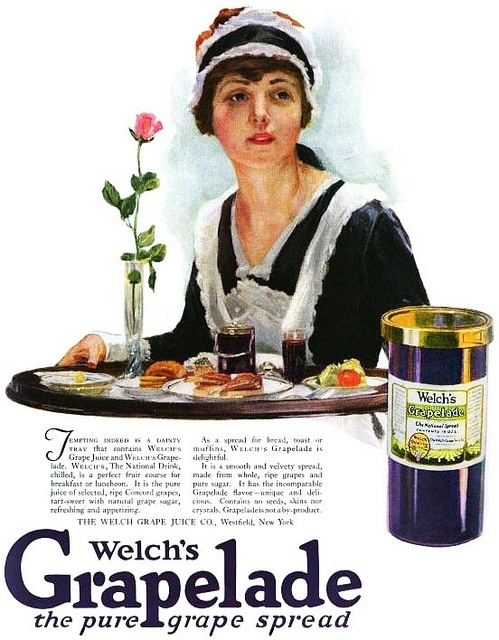 Housewives of the era also made their own jams at home, a great pastime that needs to be revived in light of the fact that all Welches products (and indeed many other jams) are sweetened with High Fructose Corn Syrup. Perhaps someday we can get back to the way food used to be made, with real ingredients not chemicals and GMOs but this can only happen if enough people challenge the status quo.